Greg Langer receiving the award from CEO Greg Miller and Community Releations Director Peggy Johnson. 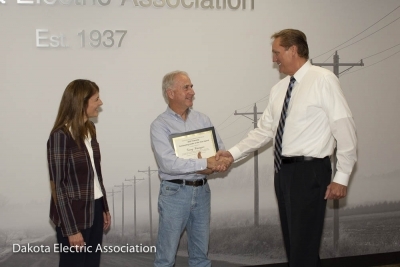 Dakota Electric Association recently awarded Greg Langer, Greenvale Township, the Outstanding Leader of the Year award. Each year, Dakota Electric seeks to recognize outstanding leadership with the award, and Dakota Electric directors Jerry Pittman and Paul Trapp attended the Dakota County Township Officers Association meeting to present the award to Langer. “It’s truly an honor to be recognized by your community members and other township officers,” Langer said of the award. He has been a Greenvale Township Supervisor since 2010 and also serves as chair. Greg has supported the local community in many ways, including serving on the North Cannon River Watershed Management Organization and the Defeat of Jesse James Days committee. He also helped organize and serves on the Road Improvement Committee and the Township Planning Commission. Langer was awarded $250 to donate to a charity of his choice, which he designated to the Dakota County 4H club.